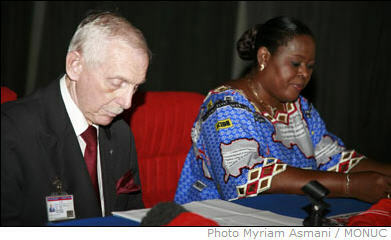 A one day plea, initiated by the Permanent Dialogue Framework of the Congolese Woman (CAFCO), for an equal man-woman representation within the National Independent Electoral Commission (CENI) was held on 7 December 2007, in the Palais de Peuple in Kinshasa. The aim is that members of Parliament respect the equality man-woman law in the bill on the CENI. On this occasion the Special Representative of the UN Secretary General for the DRC, William Swing encouraged the CAFCO for their plea which “is justified and completely legitimate” to which their representation in the future local elections depends. Moreover, Mr. Swing recalled the will of the United Nations to encourage the active participation of women in decision making. “Allow me to benefit from this opportunity to recall that the United Nations system in general and particularly the United Nations Security Council made equal man-woman representation one of their priorities. We can testify to this in Security Council Resolution 1325 on “Women, Peace and Security,” he said. Evoking engagements of the DRC on the Convention on the Elimination of all Forms of Discrimination to Women with regard to respecting man- woman equality, Mr. Swing congratulated the country in devoting article 14 of the Constitution in this regard. For recall, in the National Assembly, there are 42 women out of 500 (8.4%); in the provincial Parliament: 43 women out of 632 (6.8%); while in the old government: 9 women out of 60 (15%), and after the cabinet reshuffle on 26 November last there are only 11.1% women in the DRC government. CAFCO is an organization that brings women together and advocates for their rights all over the Deomocratic Republic of Congo.